You won’t find these benefits in any ordinary used vehicle. Find a Acura that balances both worlds by searching our Certified Pre-Owned inventory below. New Price! CARFAX One-Owner. Clean CARFAX. CERTIFIED, CLEAN CARFAX, LEATHER, ONE OWNER, SUNROOF/MOONROOF, 4D Sedan, 2.4L DOHC 16V, FWD, Espresso w/Leatherette Seats. Reviews: * Cabin does a good job of filtering out unwanted noise; rear seat offers more legroom than many competitors; loads of features for the money. Source: Edmunds Acura Certified Pre-Owned Details: * Vehicle History * Warranty Deductible: $0 * Limited Warranty: 12 Month/12,000 Mile (whichever comes first) after new car warranty expires or from certified purchase date * Transferable Warranty * 182 Point Inspection * Roadside Assistance * Includes Trip Interruption and Concierge Services * Powertrain Limited Warranty: 84 Month/100,000 Mile (whichever comes first) from original in-service date Located in Denver CO, and also serving Aurora, Parker, Highlands Ranch, Castle Rock, Littleton, Lakewood, Englewood, Lone Tree, Boulder, Colorado Springs, Fort Collins, Centennial, and Golden. All prices include Dealer and Handling of $599. New Price! Clean CARFAX. CLEAN CARFAX, LEATHER, SUNROOF/MOONROOF, LOW MILES!, TLX 3.5L V6, 4D Sedan, 3.5L V6 SOHC VTEC 24V, FWD, Graystone w/Premium Milano Perforated Leather Trimmed Seats. Reviews: * The TLX is the definition of smart luxury if you value the driving experience and appreciate Acura's cutting edge technologies like 4-wheel steering or Super Handling All-Wheel Drive over the prestige bestowed by having a European badge on your car's nose. Source: KBB.com * Quiet interior; good fuel economy ratings; sporty handling, particularly with all-wheel drive; plenty of features for the money. Source: Edmunds * Introducing the all new 2015 Acura TLX. The TLX has been shaped and trimmed to reduce drag, lift, turbulence, and rolling resistance. Weight has been reduced by using lighter tougher metals such as aluminum and ultra high strength steel. The 8-Speed 2.4L engine with 206hp with 182 lb-ft of torque has a Dual Clutch Transmission making upshifts and downshifts swift and seamless. Also available is a 9-Speed 3.5L V6 with 290hp and 267 lb-ft of torque featuring Variable Cylinder Management which lets the engine transition to three cylinders at cruising speeds enhancing fuel efficiency. Standard Precision All-Wheel Steer delivers unprecedented handling and is the first system that enables the rear wheels to adjust toe angles independently. Super Handling All-Wheel Drive is also available to direct engine power to match weight distribution. 10 stunning Jewel Eye LED headlights appear like gems in a jeweler's case and light up the night. The beauty continues inside with lit analog gauges and the On Demand Multi-Use Display touchscreen which controls audio and climate functions. The Audio System with a 15GB HDD media storage and 7 speakers allows functionality with multiple sources including USB, CD, Sirius XM, and Pandora. Also available is a 10 speaker premium system by ELS Studio. The Acura Navigation System uses hard drive data for ultra-fast response on the 8-inch screen and can display menus, maps and directions along with additional features such as Zagat restaurant reviews and real-time traffic. Acoustic noise-dampening foam introduced into the unibody provides vault-like silence. Available safety features include lane keeping assist, adaptive cruise control, blind spot warnings, and parking sensors. Source: The Manufacturer Summary Located in Denver CO, and also serving Aurora, Parker, Highlands Ranch, Castle Rock, Littleton, Lakewood, Englewood, Lone Tree, Boulder, Colorado Springs, Fort Collins, Centennial, and Golden. All prices include Dealer and Handling of $599. Have questions about our Certified Pre-Owned selection? 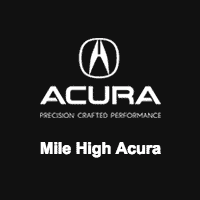 Contact Mile High Acura online to schedule a test drive or see our Certified models in person. Once you hit the roads of Aurora in your Certified Pre-Owned Acura, you’ll see why it’s an Easy Buy at Mile High.